World War II ended on September 2, 1945 as Japan formally surrendered to the Allied Forces by signing the rigid terms of the Articles of Capitulation aboard the USS Missouri anchored in Tokyo Bay. In addition to the United States, the Articles were signed by China, the United Kingdom, the Soviet Union, Australia, Canada, France, the Netherlands and New Zealand. 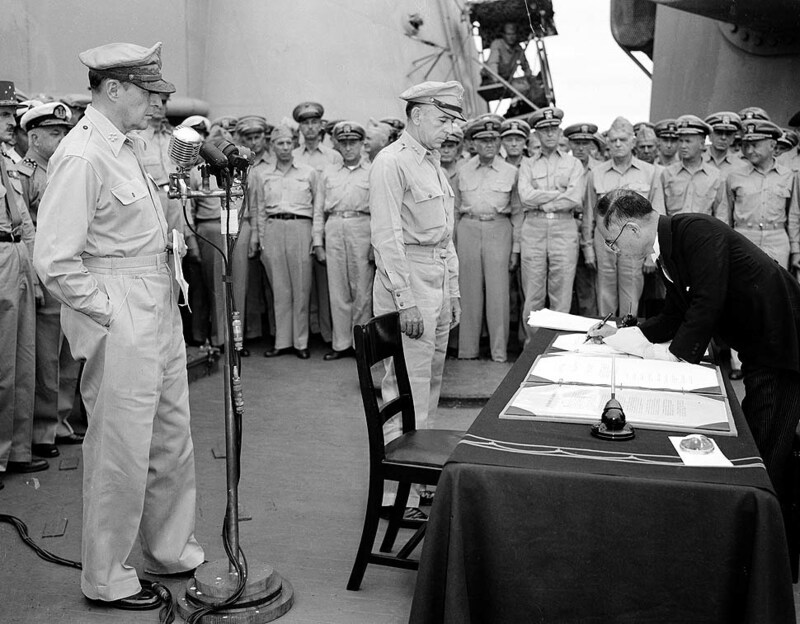 The foreign minister of Japan signs the Articles of Capitulation as General MacArthur, in left foreground, watches. Admiral Conrad E. L. Helfrich of the Netherlands, wearing white cap, is behind General MacArthur.